How long until Spring Break? It'll be so much easier then. I can't wait - especially since there is a week and a half. Plenty of time to write the better part of the final paper (only 12 pages! So happy) and to work very hard on the next couple projects. I do have my Regency Cinderella almost finished. She just needs her apron. Which I will have finished after Monday. Now in my boredom at work and perhaps associated with a touch of over studying, I mistyped a web address and managed to find the best website for linen. 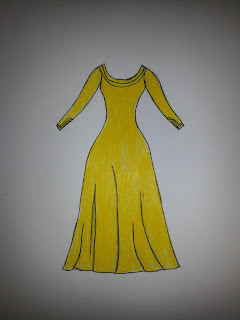 It even has the colors I wanted originally for the Damsel Gown as well as a green that will be b-e-a-u-tiful for outlaws. The website I found is www.fabrics-store.com. It has varying weights of linen in beautiful colors. All of them screaming to be made into something. Needless to say I bought fabric. There was a sale and free shipping for over $50! I bought four yards of this lovely yellow. It looks so springy! And then I bought a half yard piece of this pretty blue. I also brought their swatch card for the linen colors which shall be very useful because I'm in love with several more colors. The black is going to be my new pirate shirt. To go under the blue brocade corset. Then the yellow will become a simple 1190s/Medieval gown. I want to put embroidery on the neckline and sleeves. This is the doodle. I want it to be simple. With back lacing and a little lacing at the sleeves by the cuffs to tighten them at the wrists. The gown is one of my work in progress that I will finish one day. It is worn by a young noble maiden as she is undercover in a market. She is described as wearing an apron, shawl and veil with it. I may make the whole thing, I may not. I do know it will be part of the Historical Sewing Fortnightly. Somehow. Now I just need linen for lining and linen thread. Yay!